California's Central Coast tops rankings for least-affordable housing markets in the U.S.
Housing prices in San Luis Obispo are among the least affordable in the nation. It's no surprise that housing on the Central Coast is expensive making it hard for young people to afford to live here and for businesses to attract and retain a solid workforce. A recent report from MagnifyMoney shows San Luis Obispo, Santa Barbara, and Monterey counties — the entire KCBX listening area — are among the least affordable housing markets in the entire country, and in some cases topping that list. NOTE: This transcript is from an interview that was edited for time purposes. Randol White: Now according to your numbers the Salinas area ranks dead last in affordability followed by — directly by I should say — Santa Barbara County and then close behind is San Luis Obispo County. How does your organization crunch the numbers to come up with these rankings. Mandi Woodruff: Well you know it was sort of a selfish study if I have to be honest. I'm at a place where I've been trying to save up for a home and I'm looking at all the upfront costs, like the down payment, property taxes, you know having an emergency savings fund in the bank, and I started thinking you know how many people can actually afford all the upfront cost of homeownership. So we approached the study from that perspective. We decided to find all the median income household earnings and over three hundred different metro areas in the US. Woodruff: 380. So we were very thorough and compare that to the cost of the median listing price for a home in their area just to get a sense of you know how many years would it take you to save up to pay for a 20 percent down payment, keeping a one month mortgage payment, emergency cash fund on the side, and then to handle those closing costs which I think a lot of people forget about which can range from, anywhere from two to five percent. For our study we decided to you know stay in the middle and go for 4.5 percent. White: And then you broke the numbers down even more by basing by breaking it into age groups. What tends to be the optimal age for those hoping to buy their own home and when's the most difficult period. Woodruff: You know I think the sweet spot is definitely if you're in those middle age years between 40 to 65. Those tended to have the longest time lines in terms of saving for home, and I mean likely people in that age bracket typically have higher rates of homeownership so they're already in their homes. I felt really badly for the 25 to 44 — that's the age range that I actually fall into — in many places, nowhere in the U.S., if you were in that age bracket, could you save for a home and under two years and no age group could save for home and less than one year. 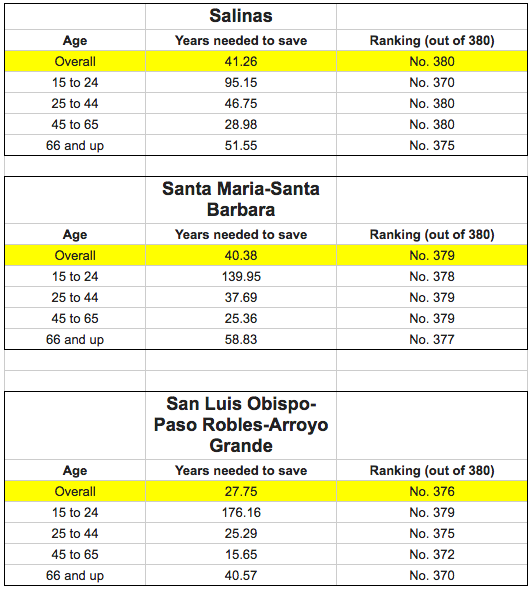 White: A chart you shared with us, which we will post online for those who'd like to see the numbers for themselves, shows the Salinas area ranking dead last — as I mentioned before — in affordability. I think some people listening right now may find that a bit surprising but maybe not when you take average wages into account. Correct? Woodruff: Yeah, I think we're really skewing, you know what I've heard of this area — I don't know what's happening in central California — but it's a very, it's a quite agricultural area, right? So I think a lot of people who maybe work in that industry and have lower wages could have been skewing the median income for this area. I'm sure there are some quite high earners but they might have just been outnumbered by the lower earning workers who probably don't live in Salinas anyway considering you know the average, or the median house there according to our data which came from Zillow was over $700,000. White: And then Santa Barbara County coming in second, I don't think is a surprise to anybody because there you do have high-wage earners as well as... But, this is a case where the homes themselves just cost so much. Woodruff: Outrageous, close to $800,000. I was shocked. I love Santa Barbara. I mean I guess not so shocked, it's so gorgeous. I feel like you have a lot of retirees there, a lot of older people who are more established living in that area. Yeah. I can understand why it's been difficult to attract maybe younger workers to areas like this considering the cost of homes are so high. White: Now San Luis Obispo County did come in second place in one category and that was those aged 15 to 24. It shows here they would need 176 years of savings in order to afford a home here. So basically what you're saying is, if you're graduating from high school here in SLO County or you just came to Cal Poly, you're not going to buy a home here, ever. Woodruff: Good luck. Yeah you know what, there is basically two different kinds of borrowers that we found in our study. There are the people who earn enough to qualify for mortgage large enough to match the price of homes in their area. And there's people who would never qualify for a mortgage loan large enough, and for that second group which you know the 15 to 24 bracket would fall into, it's basically impossible. I mean you're not going to get a big enough mortgage so that means you'd have to come up with the cash and it would take you according to our calculation over 175 years to do that. White: Wow. OK. So the central coast we should say is not entirely isolated here. It's really a California problem as well. Is it eight-out-of-10 or nine-out-of-10 of the of the least affordable places are here in the state. Woodruff: Nine-out-of-ten with a little cameo from Hawaii. Yeah. You know I wasn't, I was kind of surprised. You go into it with your own preconceived notions about different states. I live in New York City so I really expected us to be higher on the list but we weren't. San Francisco you can sort of see why it's in the top 10, and Los Angeles as well. But I think that the top three tend to rank more unaffordable just based on wages alone. I mean people in those areas tended to earn less than people living in Los Angeles and San Francisco which of course makes it more difficult to match those high home prices. White: NPR just did a piece this week on ALL THINGS CONSIDERED about those in retirement age in Santa Barbara County living in their cars now because they can't afford a place to retire. Woodruff: I believe it, I believe that for sure. It's the third most expensive place for 66 and up you know and that's an age group that we didn't and we could have delved into more in the study and and I'd like to because you don't really, you think about people who are over 65 and are looking to downsize their homes maybe, and what they're finding is the value of their homes may not even match the the the value of new homes that they might move into. White: Now let's flip the whole chart upside down. Affordable places. Where are those popping up in the country. Do you have to live you know somewhere in the south or Midwest? Woodruff: Midwest completely dominated the most affordable cities, which my mother is super happy about. She's from Wisconsin. Yeah you could basically save up for a house for all age groups. You'd basically be in a house within three years if you're looking at the Midwest and closer to two if you're looking at our most affordable metro area which is a lovely Danville Illinois. White: I anchored the news for six and a half years in Madison, Wisconsin and I I just remember the reverse sticker shock I had when I looked at homes there, which Madison is considered one of the more expensive cities in Wisconsin, and still I found it exceptionally affordable. Woodruff: It really makes you question your life choices when you see stuff like this. What are we doing here? White: Mandi Woodruff executive editor at MagnifyMoney. Joining us to help explain the housing numbers here on the Central Coast where San Luis Obispo, Santa Barbara, and Monterey counties are among the least affordable housing markets in the entire country. Mandi thank you so much for joining us here on KCBX. Woodruff: Thanks for having me.